Hungry Planet is both an inspiring and sobering view the state of eating habits and health of people around the world. To produce Hungry Planets the authors take the simple concept of photographing 24 diverse families from 30 countries surrounded by the foods they eat in an entire week. The result is not only a collection of wonderful cultural snapshots but a stunning commentary on some of the most critical issues facing the world today from health issues and cultural traditions to sustainability and global warming. Every image in the book is thought provoking and quietly provocative, it is indeed a sobering view to see the assorted junk and packaging one family consumes in a given week and compels one to reflect on their own eating habits. 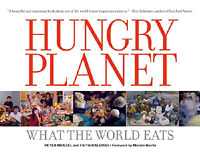 In compiling Hungry Planet the authors travelled around the world and took snapshots of typical meals of families from the heaping plates at middle-class mealtimes to the meager communal bowls shared by families crushed by poverty.’ The attempt was to provide a fair representation of all ages, all classes from feast to famine. Some of the countries profiled include Australia, Havana, Bosnia, Mexico, Germany, England and the United states to a refugee camp in Chad. The accompanying text makes for easy and illuminating comparisons. Included are statistics of a one week breakdown for the representative family of both quantity consumed and dollars spent on food. In addition to the family shots and their weekly grocery pile, there are shots that tell their story through their neighbours, their community, their lives at work, shopping, at play and at home. Interspersed throughout are essays from noted intellectuals, scientist and authors offering a critical and often hopeful view on how the world feeds itself and how we can feed tomorrow’s generation. The message is clear, the path developed nations have taken is not sustainable from an environmental perspective and the fast food culture and over-processed, over-packaged unhealthful foods consumed by the majority are a deadly combo. 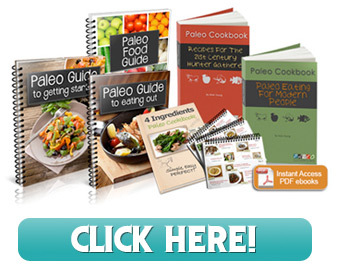 30 families, 24 countries, 600 meals – 1 extraordinary book.